Which LG G7 ThinQ color variant do you like most? 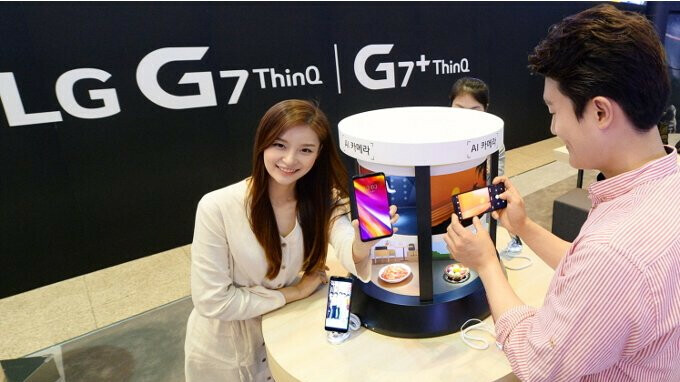 Last week, LG announced its latest and greatest flagship smartphone, the G7 ThinQ, showcasing four color variants of it. Called New Platinum Gray, New Aurora Black, New Moroccan Blue, and Raspberry Rose, all four colors are glossy and reflective - while this may not be apparent in promo images, real-life photos (like the first one seen below) do a better job at revealing the glossiness. Right now, it's unclear if all LG G7 ThinQ color variants will be available in the US. In any case, we want to know which of the four official colors you think suits the G7 best, so feel free to vote in our poll here, or chime in in the comments section. The LG G7 ThinQ will be available to pre-order starting later this month, for prices that have yet to be announced. The smartphone will be sold by Verizon, T-Mobile, Sprint, and US Cellular, but not by AT&T (which may instead release an LG V35 ThinQ sometime this summer). Meanwhile, you can find out more about LG's newest high-end handset in our G7 ThinQ preview. Blue is the least ugly. New miracle blue. This phone is the second best after the Galaxy S9. So far non of them is specially appealing to me. Need to see in real life. But I'm afraid LG will find out which color is the most popular and offer it at increased price. Because there is nothing else in this phone LG could ask premium for.